Why did I want to trial this wrap? I liked the patterns it was available in especially the owls (I have a particular fondness for retro owls patterns) and the dinosaur print looks pretty cute too. You also get to choose between poppers and velcro. Which options did I choose? I choose the owls pattern and the poppered wrap. Where was it bought from? I bought the wrap from the Nappy Lady, the wrap was on special offer and delivery was free which is always helpful. I was a little bit disappointed that the print on the wrap wasn’t as bright as pictures seemed to indicate. It looked well constructed and I liked the ability to adjust the height with poppers. Eli is quite petit and so his size 2 wraps swamp him a little bit – this wrap should be great because it can grow with him. We used the wrap for the night-time nappy the day we received it. It fit well over Eli’s bamboozle stretch and there was no wicking even though he wore the nappy until just before breakfast. I’ve used the wrap quite a few times overnight and once during the day. During the day trial I had a small issue with wicking (something I’ve found before with gusseted wraps and may have been more a factor of the flexitot it was covering not being up to full absorbency) but there were no issues overnight. Would I buy more (if I needed a new wrap)? I have to qualify this one because we have plenty of wraps but I do like these and would seriously consider buying another one (probably with dinosaurs on it…) if I needed a new wrap. Why did I want to trial this nappy? I’ve seen them on nappy sites and they looked cute (yes I am clearly easily swayed by how pretty a nappy is). The construction is a bit different to my other nappies and so I was interested to test that as well. I opted for the bamboo nappy in the monkey print. I bought the nappy from Kittykins – it’s a site I’ve used often in the past and delivery was free. It looks great. The nappy is simple to put together (and the coloured soakers mean it’s easy to see what belongs to the nappy). I liked the instruction insert which gave guidance on what level of poppers to use depending on the weight of your baby, I haven’t seen that before on my other one-size-fits-most nappies. The bamboo does take a while to dry once washed (I had to wait impatiently for it to dry so that I could use it for the first time!). It was easy to fit and looked really cute on – sadly I didn’t get much of a chance to trial it as Eli did a poo in it within 10 minutes… Second trial was a bit more successful – usual length of wear (about 3 hours), no leaks and Eli seemed comfy. I love this nappy and am currently trying to figure out a way to afford a few more. I’m regularly disappointed when I use the nappy and then can’t use it again until after the next nappy wash.
Definitely – just need to find a good offer as I’ve got too many nappies to need any more. We should be going to the Baby Show in October – hopefully Close will have some deals there! When Tilly was in cloth nappies I tried to use cloth wipes as well. I say tried because I found it a bit of a pain. I couldn’t figure out a convenient way to take them out with us and so we used disposable wipes outside of the house and the containers I had at home weren’t quite the right shape nor did they keep the wipes fresh for long. It didn’t take long before we were using disposable wipes all the time and the cloth wipes were consigned to the cupboard. With Eli, I wanted to use cloth wipes again (to save money on buying wipes if nothing else) and knew I needed a better solution and then I found Cheeky Wipes. 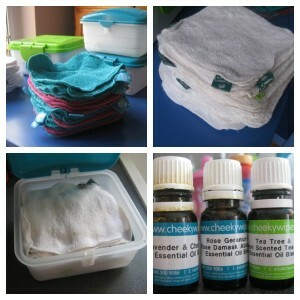 Basically, a Cheeky Wipes set comes with two wipe containers, one for clean wipes and one for dirty, 25 wipes (cotton terry as standard), two bottles of essential oils, again one for clean wipes and one for the dirty wipes box and two waterproof bags for carrying your clean and dirty wipes when you’re out of the house. You can get a mini-kit for cloth nappy users that excludes all the dirty wipes bits (box, essential oil, waterproof bag) as you can just pop the wipes in the nappy and into the nappy bucket. We have the full kit because we started using the wipes before we switched to cloth full-time – Cheeky Wipes are brilliant even if you’re using disposable nappies! We’ve also now bought a second mini-kit set with coloured wipes that we use for cleaning Eli up after eating – we’ve saved a fortune not using disposable wipes. I’ve found that 25 wipes will often last me for 4 or more days and I haven’t had any issues with the wipes smelling stale at all. How easy are the wipes to wash? We wash our bum wipes with the nappies and the hands and face wipes with an ordinary coloured load of clothes. How long do they take to dry? Not long in the tumble drier or if air-dried – they don’t need to be dried after washing if you are going to put them straight into the clean wipes container. The first ever cloth nappy I bought was a Tots Bots, a blue Tots Bots Cotton Tot, a shaped nappy made from terry cotton. When Tilly was in cloth she was in Tots Bots Flexitots a two part system. Needless to say I love Tots Bots nappies and they’ve moved on massively since my first cotton tot – when I discovered the Easyfit whilst choosing nappies for Eli I promptly bought a few to try. I then bought quite a few more as they were great and when they brought out the version 3 we then bought even more! Which sizes do we have? They are one-size nappies so will fit from newborn to toddler – there are two levels of poppers on the front to make the nappy smaller. How long would we be able to use just this part of our stash? About 3-4 days, I could (if I didn’t love some of my other nappies so much) only use these and still not have to do much washing. How often do these nappies need to be changed? These nappies can easily last 3+ hours – the version 3s especially are brilliant at not leaking even after 4 hours. How easy are these nappies to wash? We wash all our nappies together and don’t need to do anything special for these. I do take the tongue out of the version 3s because, unlike the version 2s, I find that they don’t tend to come out in the wash. I tumble or air-dry the version 2s and they don’t take too long to dry via either method. I air-dry the version 3s and they’ll generally be dry by the following day if I hang them inside and within a few hours if outside. If you use cloth nappies then at some point you will need to change a nappy outside of the house and then you will need to figure out a way of returning said nappy home so that you can wash it. Some people simply use nappy bags or supermarket bags but I much prefer to use a purpose made wet bag. When I used cloth nappies with Tilly I had one wet bag – it was big, drawstring neck and not particularly pretty. Now I have 8 wet bags, which sounds excessive but I’ve needed each of them although they aren’t all in my regular rotation. This is not the prettiest of the bags I own but it was reasonably priced and it does the job. I think it’s a little big for daily use but it can hold a day or mores worth of nappies if needed. I used it for overspill before I bought my second nappy bucket but it’s retired for the moment. I tend to prefer zippered bags now and this one has a drawstring which I think tends to lead to more smells if the nappies have to remain in it for a while. We have 4 of these wet bags – 1 in each of the sizes they make; small, medium, large and x-large. I bought a set because we wanted to take our nappies on holiday with us and needed a big wet bag that could hold a lot of nappies and would contain their smell as well. The XL Bum Deal wet bag was brilliant – I used it to store all the day nappies and its slightly smaller sibling the L bag to contain the night nappies. 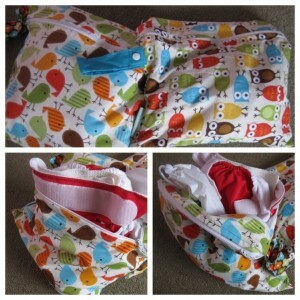 The zips did a great job of holding in smells and I could fit a lot of nappies in both. Having the option to buy the bags in a set – for much less than all four together – made these bags very economical too. I don’t use them regularly but that’s no reflection on the bags, it’s just that I prefer to use my double wet bags (My Little Patch) day to day. I would definitely take the Bum Deals if we headed off on holiday again. This was the second wet bag I ever bought and I used it regularly until I bought my first double wet bag. It’s still in use as my back up bag for when I’m going to be out for a while and will need additional wet nappy storage. The Itti Bitti wet bags are a perfect size for nappy changes when you’re out and about as they hold about 4 nappies and fold down small when not in use. They aren’t the cheapest bags available (keep an eye out for sales) but they do look great as they’re available in the same colours and prints as the Itti Bitti nappies. I love my My Little Patch bags. The choice of sizes and fabrics is fantastic and the bags can be hung from a wrist or buggy. Both my bags are medium doubles. This means that they have two pockets and so I can put clean nappies and my bag of wipes in one side and dirty nappies on the other. I often just take the wet bag instead of a fully changing bag if I’m not out for long as it cuts down on all the stuff I end up carrying otherwise. These aren’t cheap bags but they are well made and there are regular sales and discounts offered (hence why I just had to buy one more), plus loads of different fabrics to choose from. So, that’s our wet bags – an essential but not one that needs to be any less pretty than the fluff it carries. As we use two part nappies for night times (this reduces the chances of a leak) we need to use a wrap along with the nappy itself. Our night nappies are Tots Bots Bamboozle Stretches and our night wraps are Tots Bots Flexiwraps and Motherease Airflow wraps. I’m happy to use either wrap but am currently preferring the airflows as they seem to provide a slightly better fit as Eli heads towards the top of the size range for both. 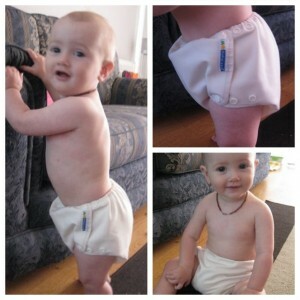 trim fitting – not so much a consideration for a night nappy but useful if they are needed for days. make his bum look massive which I find really cute. The airflows are a bit bulky when used with a day nappy but it doesn’t matter for me at night. Currently in use I have 5 – two flexiwraps and three airflows. When Eli outgrows these I have the same again plus a few more for him to use. We have size 1 and 2 flexiwraps and medium and large airflows. Eli is currently using size 1 and medium (both go up to 20lb). I have enough for our night nappies in our current sizes but will have a few spare when he moves up. How often do these wraps need to be changed? They last for 12+ hours overnight and I don’t tend to get any wicking unless I leave the night nappy on too long in the morning. How easy are these wraps to wash? We wash all our nappies and wraps together and don’t need to do anything special for these. I just need to make sure that the aplix is done up on the flexiwraps. Both types of wraps air dry very quickly either indoors or out. When we first started using cloth nappies at night we used a combination of Tots Bots Cotton Tots and Easy Peasy Bumbles. This worked for a while and then the leaks started. Eli was wetting heavily at night and we were regularly getting big leaks that soaked his clothes, sleeping bag and our bed. I doubted that we would have much more luck with a disposable overnight as we moved to cloth at night because of leaks using disposables! I wanted a more absorbent nappy and I knew that bamboo tended to be better than terry so bought a bamboozle stretch as a trial. It worked brilliantly and so I bought 4 more and ditched the other night nappies (except for emergencies). We don’t use the bamboozle stretch as a day nappy (although I think it would work really well as one I’ve got too many other nappies to need to use it that way!) and so this review is wholly based on its use as a night nappy. available in natural (which is what we have) or a variety of other colours to match other Tots Bots nappies and wraps. As with most night nappies these do need to be boosted to give extra absorbency – we use a Tots Bots bamboo booster as it’s quite slim and doesn’t add too much more bulk to the nappy. These are two part nappies and need a waterproof wrap over them – we use Tots Bots Flexiwraps and Motherease Airflow wraps. 5 days assuming no need for an overnight nappy change (which is a very rare occurrence). These last 12+ hours overnight. We wash all our nappies together and don’t need to do anything special for these. I do unpopper the inserts before washing. They are bamboo so not the quickest at drying but dry in the tumble drier on my usual cycle or on the line after 4-5 hours. When I was looking at nappies online, before I bought any new nappies for Eli, I really liked the look of the Itti Bitti nappies. We then bought three at the Baby Show to try and well we haven’t bought any more. I just don’t like these as much as my other nappies but I still use them regularly and they do look very cute! the ‘poo fence’ really works. I find the trim fit around the legs means lots of wicking. They are one-size nappies so will fit from newborn to toddler – there are three levels of poppers on the front to make the nappy smaller. Not long – less than a day but in theory if we had extra soaker sets we could make them last longer. To avoid wicking it is best to change these every 2-3 hours. We wash all our nappies together and don’t need to do anything special for these. I unpopper the inserts and wash them with the covers. the soakers dry in the tumble dryer (the small soaker is always the last thing to be dry) or will be dry within 4-5 hours on the line outside. leaks don’t tend to cause much bother – I tend to find the gPant gets wet/dirty but not the clothes Eli is wearing. not as reliable in the sling as other nappies – due to compression breaking the seal of the gPouch I think. A few months ago I was getting very frustrated with my gNappies, I struggled to get more than one wear out of a gPant due to leaks and I just couldn’t work out where I was going wrong with the fit. Well I think I’ve got it sussed now, you really, really, really have to make sure that the pouch is right in the crease of the leg. The fitting info from gNappies does tell you all of this but I don’t think I realised until recently just how deep into the crease the pouch had to go and getting it in the right place turns these nappies from duds to in regular use (so much so that we had a total gNappy day today). There are helpful videos on YouTube (search for gDiapers the brand’s US name). We have medium gPants and I’m pretty sure that’s all we’ll need until Eli potty trains as they are good up to 28lb. We only started using cloth when he was 13lb so never needed a smaller size. 2 and a bit days (we would have to use a different nappy at night, these are not night nappies). To avoid leaks it is best to change these every 2-3 hours. We wash all our nappies together and don’t need to do anything special for these. As we wash at 40°C I don’t bother to separate off the gPants to wash with clothes (as is the gNappy recommendation). All I need to do is make sure the pouches are unpoppered from the pants and that the velcro tabs are turned back. the gCloth dry easily in the tumble dryer or will be dry within 4-5 hours on the line outside.